Welcome to Aircomm Services Ltd.
Aircomm Services Limited is an established company specialising in site surveys, design, installation and commissioning of all types of air conditioning, from individual split type systems to large commercial VRV and VRF systems. We have our own in-house service and maintenance, and office refurbishment division which enables us to offer our clients a complete and highly professional service. Aircomm have come to the forefront of air conditioning, designing heating and cooling systems for installation in the commercial and domestic market place. 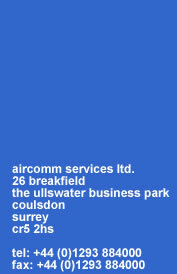 © Copyright 2008 Aircomm Services Ltd.